In early 2012, ISO New England established the Energy-Efficiency Forecast Working Group (EEFWG), which is made up of utilities, regulators, and other stakeholders with expertise in energy demand forecasting programs, to assist the ISO in developing the annual forecast, including data collection, assumptions, and model parameters. The proof-of-concept process determined the types of data elements and level of granularity required to implement the energy demand forecasting model. The next step was to develop data specifications and data reporting tools for use by program administrators and state regulatory agencies. This resulted in the collection of multiyear, annualized data for each program administered by the region’s utilities. Specific metrics included achieved and committed annual and lifetime net energy savings in kilowatt-hours; demand savings in kilowatts; planned and expended budget dollars; program type, such as building retrofit or new construction; customer class ( i.e., residential, commercial and industrial, and low income); EE measure type, such as lighting; and project status. 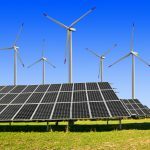 In addition, state energy regulatory agencies provided projections for budgets ranging from one to 20 years into the future. The forecast model is a budget-based estimate of peak demand savings derived from historical annualized net energy savings, the ratios of peak demand savings to annual energy use savings (MW/MWh), production costs, and future sources of revenue. The model includes factors designed to capture the uncertainty associated with future revenues, budgets, production costs, and changing technology. To address the major challenge of predicting future budgets, the ISO developed a budget uncertainty factor, with input from the EEFWG, based on expectations that changes in state priorities and legislative budgets could occur. The uncertainty factor is modified annually with actual budget figures. Production costs also were escalated annually by 5 percent in most states to account for increasing EE saturation rates and standards or policies that drive up costs for new technology. Program administrators’ experience shows that, over the long run, the cost of saving a megawatt-hour of electricity is likely to increase as less expensive measures are widely implemented. A 2.5-percent inflation rate was factored in as well. Additionally, for states where production costs were significantly lower than the regional average, a second cost-escalation factor was applied to bring these programs’ costs closer to the mean. In states such as Massachusetts and Rhode Island, where program budgets are expanding rapidly, a larger discount to future budgets was applied to reflect the potential challenges of meeting these spending targets. 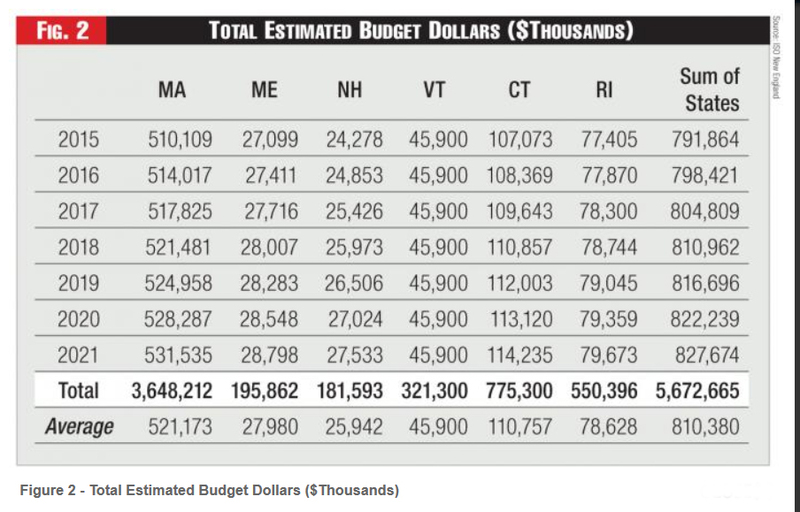 Finally, the forecast estimates the cost of producing EE savings in each state. For instance, the forecast estimates the cost in Maine will rise from $300 per megawatt-hour ($/MWh) in 2014 to $555/MWh in 2021. At the high end of the production cost scale, the forecast estimates a Massachusetts production cost of $530/MWh in 2014 rising to $880/MWh in 2021 (See Figure 1) . 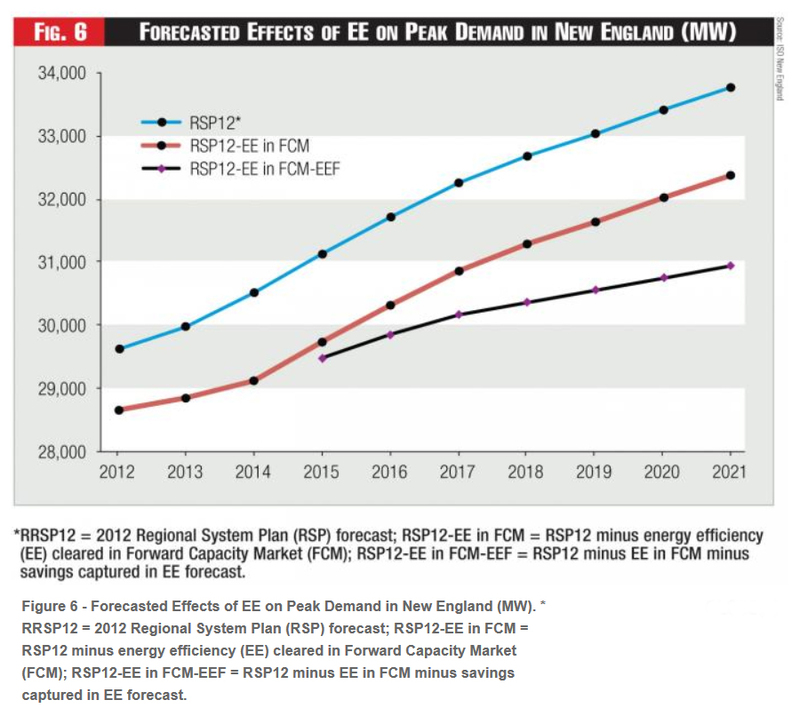 ISO New England developed its EE forecast on the same timeline as its traditional load forecast, with the results of both forecasts incorporated in the ISO’s annual Regional System Plan and the annual Capacity, Energy, Loads, and Transmission report. The first EE forecast, which ISO NE posted in April 2012, shows estimated savings in energy and peak demand for the region and in each state from 2015 to 2021. As noted, the first three years (2012 to 2014) of the long-term forecast incorporate the savings from EE procured through the FCM. The forecast shows an average annual energy saving of 1,343 gigawatt-hours (GWh), and total savings of 9,399 GWh from 2015 to 2021 (See Figure 3) Currently, the region consumes about 130,000 GWh annually. 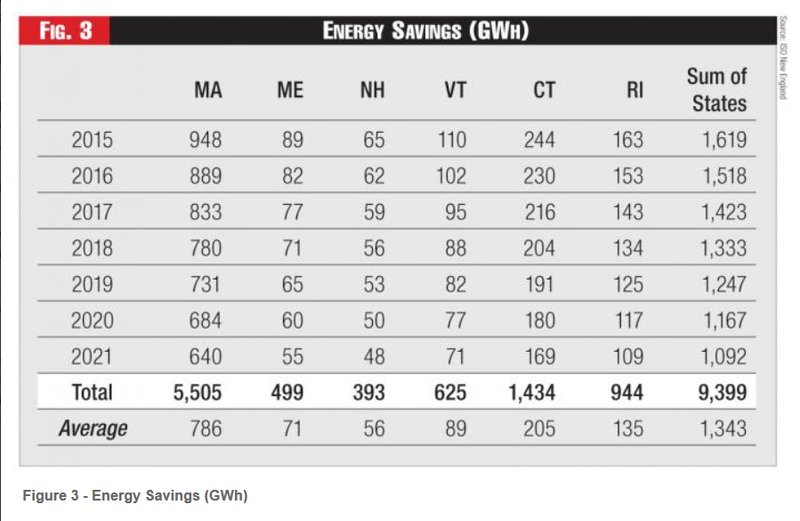 The states’ average annual energy savings ranged from a low of 56 GWh in New Hampshire to a high of 786 GWh in Massachusetts. Overall demand for electricity is projected to remain flat in the region, while in Vermont and Rhode Island, energy demand is projected to decline (See Figure 4). The forecast also estimated average annual peak demand savings for the region at 206 MW, while projected cumulative peak savings totaled 1,444 MW from 2015 to 2021 (See Figures 5 and 6) . 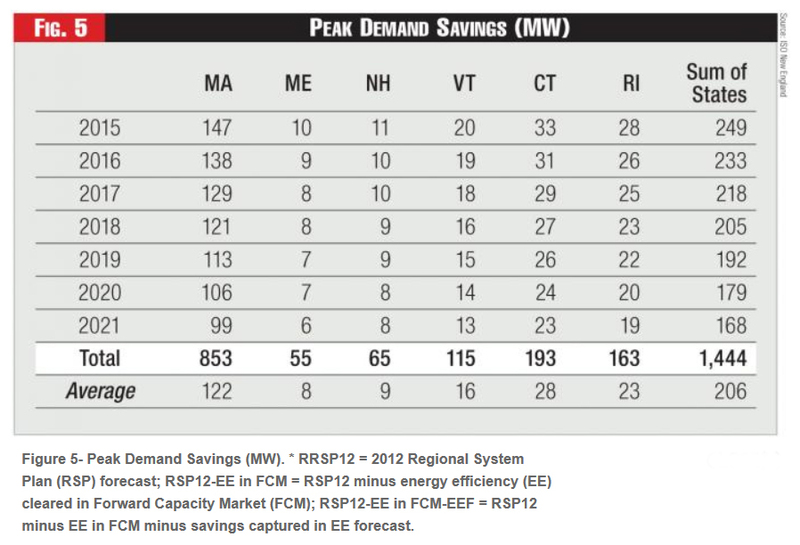 The states’ average annual peak savings ranged from a low of 8 MW in Maine to a high of 122 MW in Massachusetts. 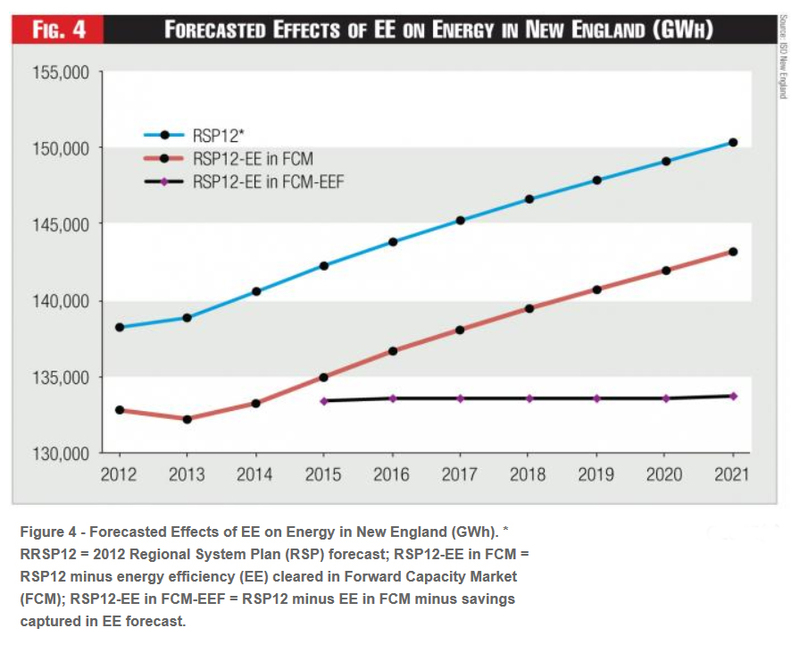 Now that it’s in place, ISO New England’s long-term EE forecast will be applied to load levels used in studies looking beyond the three-year FCM timeframe, including long-term transmission needs assessments and solutions studies, and other studies such as generation interconnection or transfer limit analyses, if the study timeframes permit. While the FCM provides ISO New England with an accurate and comprehensive understanding of energy savings to be expected from EE resources over the short term, the ISO has worked with its stakeholders to collect and analyze information gathered from the region’s EE programs, and the analysis of this information has advanced the ISO’s understanding of EE from the anecdotal to the empirical. The result is the nation’s first multistate, long-term forecast of energy-efficiency savings. System planners and stakeholders now have a tool that includes the most complete EE data set possible to serve as a resource for future analysis in a changing energy landscape. When incorporated into the ISO’s planning activities, this forecast should ensure that the region’s large investments in EE are fully accounted for and have an appropriate effect on regional transmission planning decisions. 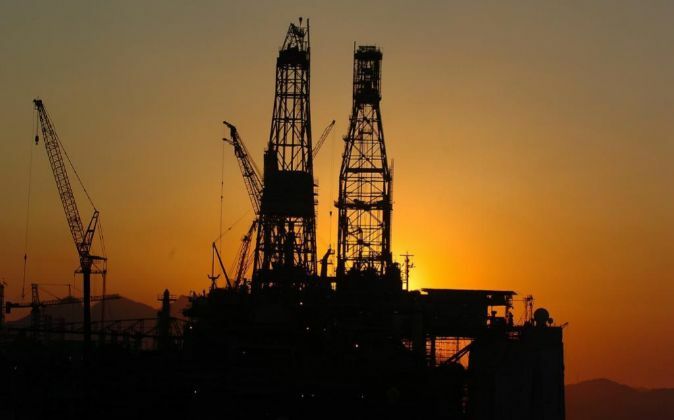 Monitoring the actual delivery of EE savings to the system and refining the inputs to the forecast model will continue to be an important part of implementing the EE forecast in planning. The ISO’s Energy-Efficiency Forecast Working Group will continue to provide input to the forecast assumptions and feedback on model results as the region gains experience with the forecast. With a 10-year planning horizon, timely corrections to the forecast will be possible as system planners seek solutions to the needs identified in long-term transmission studies. 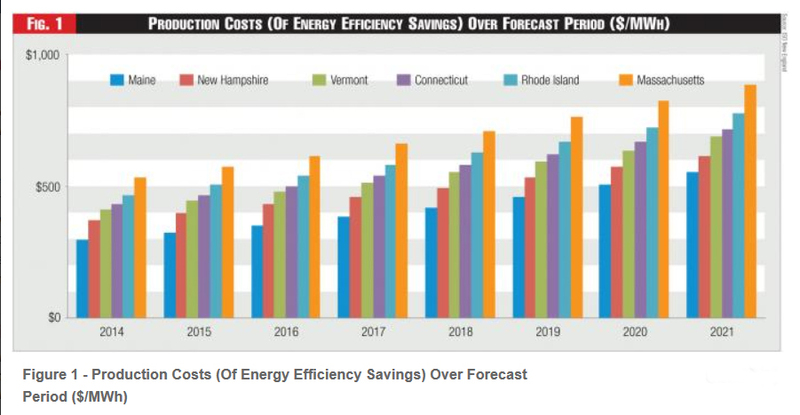 As the trend of energy-efficiency spending continues to increase across the country, New England’s multistate EE forecasting model is helping the region measure the growth, success, and effects that state-sponsored EE programs are having on the power system.